We have survived another two weeks of President Trump’s multi-media reality show. Because the star continues to approach his job with the research, responsibility, and nuance of a Golden Age comic book writer, I’m continuing to respond in the form of one-panel political comics, AKA Facebook memes. Bob did however “phone it in” for a fake town hall before going AWOL. In addition to my ostrich and Where’s Waldo? spoofs, I also made Bob a wild west Wanted poster. The first version included the generic phrase “Dead or Alive,” which some especially conscientious folks on Facebook objected to, so I removed it from the second version. Finally, I make a cameo in the last meme. That’s me standing next to Bob’s cardboard cutout at the town hall held in Roanoke last week. It was an overflow crowd, even though everyone knew Bob wasn’t going to be there. That might help to explain why Senator Kaine is reporting a 900% increase in calls and letters since the election. I started this series on African-American superheroes and creators searching for the “Golden Age” that Trump promised his voters. So far I’ve eliminated the 30s, 40s, 50s, 60s, and 70s. Many consider Ronald Reagan the greatest President in history, and in fact the 80s are the most positive decade I’ve found yet. But not for the reasons some conservatives might think. The early 80s is a transitional moment in black representation. When DC re-introduced the Teen Titans in a 1980 DC Comics Presents backstory, Guardian-Hornblower was absent, but the team now included Marv Wolfman and George Pérez’s Cyborg, who would also be featured in the following month’s The New Teen Titans first issue. Pérez’s black and white costume design literalized the duality of African-American identity by juxtaposing the character’s exposed skin with his white machinery—arguably an extension of Lee and Kirby’s Africa/technology binary established in Black Panther’s 1966 debut. Pérez’s costume design, at least the eighth iteration of a black male superhero with a chest-exposing top, pushed the motif to its final extreme. The effect, writes Davis, reminds “the reader that he is more than just a mere robot,” while “reinforcing the double consciousness that he embodies” as a black character (2015: 209). Cyborg also deepened the trend away from the use of “Black” in superhero names and so deemphasized race as a black characters’ most defining trait. Uncanny X-Men writer Chris Claremont established Storm as team leader in 1980, a role the character would play extensively and through multiple authors and titles for the following four decades. Marvel followed with two new superheroes in 1982: Bill Mantlo and Ed Hannigan’s Cloak of the Cloak and Dagger duo premiered in Peter Parker, the Spectacular Spider-Man and Roger Stern and John Romita, Jr.’s new female Captain Marvel, Monica Rambeau, in Amazing Spider-Man Annual. A Cloak and Dagger mini-series followed in 1983, and Captain Marvel would appear regularly in The Avengers until 1988, including as team leader. The Falcon also received a mini-series in 1983, and Jim Rhodes, as scripted by Dennis O’Neil, assumed the lead role in Iron Man and in the mini-series West Coast Avengers until 1985. Beginning in 1984 John Stewart similarly replaced Hal Jordan in Green Lantern, until the retitled Green Lantern Corps was cancelled in 1988, the year Black Panther returned in a mini-series. In 1986, John Ostrander, Len Wein, and John Byrne introduced Amanda Waller in Legends; though not a superhero, and often villainous, Waller would become one of the most prominent black female characters in the superhero genre. The 80s also marked an increase in African-American creators working in superhero comics. Mark Bright entered in the late 70s, soon followed by Denys Cowan, Larry Stroman, and Paris Cullins. Wayne Howard left the industry in 1982, and Billy Graham died in 1985, but Ron Wilson continued to draw Marvel titles through the 80s. Bright teamed with writer Jim Owsley on the 1983 Falcon four-issue mini-series and the final ten issues of Power Man and Iron First in 1986. Arvell Jones became the primary artist for DC’s All-Star Squadron in 1984, and Keith Pollard’s titles included Green Lantern and Vigilante. Chuck Patton was lead artist on Justice League of America from 1983-1985, Milton Knight drew the retro-style Mighty Mouse for Marvel in 1987, and Malcolm Jones inked DC’s Young All-Stars into the late 80s. Cowan drew the 1988 Black Panther four-issue mini-series, while also teaming with Dennis O’Neil on the 1987-90 The Question. Joe Phillips started his career on NOW Comics’ Speed Racer in 1987, and Brian Stelfreeze would be featured as the primary cover artist for DC’s Shadow of the Bat in the 90s. As black writers grew more prominent, black representation grew more complex. 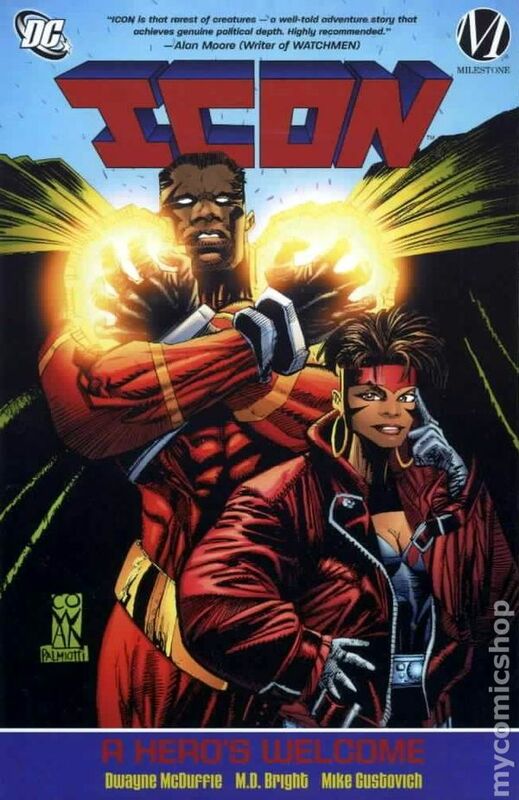 In 1989, Bright and Dwayne McDuffie revived Monica Rambeau for the single issue Captain Marvel. Bright replaced Rambeau’s previously vague afro with distinctly rendered cornrows, a first for a black superhero. Beginning in 1990, Cowan drew McDuffie’s Deathlok, a reboot of the early 70s cyborg super-soldier. Matt Wayne, eulogizing McDuffie after an award for diversity in comics was named after him, called McDuffie “the first African-American to create a Marvel comic,” one who “challenged our worldview, but so subtly that we could ignore it and watch the explosions, if that’s all we wanted” (Wayne 2015). McDuffie said himself of Deathlok, “I also managed to sneak in something of myself, Humanistic values somewhat at odds with the conceit of vigilante fiction” (2002: 29). In his March 1991 script draft for issue #5, he explained to Cowan: “I’m trying to implicitly connect the cyborgs to mutants and oppressed minorities” (2002: 49). At the story’s conclusion, Deathlok holds a copy of W.E.B. DuBois’s The Souls of Black Folk, which he quotes at length (56). McDuffie’s collected run is titled The Souls of Cyber-Folk. In 1993, McDuffie and Cowan created Milestone Media with Michael Davis and Derek T. Dingle. Jim Owsley was originally involved, but left before the founding. Unlike other independent comics companies, minority-owned and otherwise, Milestone partnered with DC in order to secure wide distribution while also maintaining creative and legal control of its properties. Both the Milestone and the DC logos appeared on all covers. Milestone launched four titles in its first month: Hardware, Blood Syndicate, Icon, and Static, all written or co-written by McDuffie, with three more titles to follow in 1994, plus the DC-Milestone multi-title crossover and one-shot Worlds Collide the same year. Like Deathlok, Icon’s Robin-esque sidekick Rocket, Raquel Ervin, reads from her copy of DuBois in the Icon premiere. McDuffie also alludes to Booker T. Washington and Toni Morrison, but the four-page wordless opening is most striking for its revision of the Superman origin story. Instead of the early twentieth-century mid-west, Icon’s spaceship crashes near a 1839 cotton field where an enslaved black woman, not an elderly pair of white farmers, adopts the alien infant. August Freeman, now a lawyer and a “big rich, conservative” (McDuffie & Bright 2009: 167), hides his abilities until challenged by his future sidekick, a black teenager named Raquel: “I told him how just seeing him opened up a whole new world of possibilities for me … how I thought he could help lots of people if only they could see what he can do” (23). Her challenge also encapsulates Milestone’s mission. Echoing O’Neil’s 1970 Green Arrow and Green Lantern, Rocket teaches Icon that submission to authority is misguided when authorities abuse their power—as when white police officers attack them without provocation. She also brokers a truce with a gang of mutated criminals, the Blood Syndicate, challenging them to do more than fight turf wars (143). With a supporting cast that includes Raquel’s grandmother and a female African-American mayor, Icon contain a range and density of black characters previously unseen in superhero comics. Life in Trump’s alternate reality provided its usual opportunities for political memes these past two weeks. The first below is a reference to Clinton’s final vote count, 2.9 million more than Trump, and of course the Republican insult of calling liberals “snowflakes.” Mussolini made a couple of encore appearances, flanked again by the ironies of Trump’s anti-establishment rhetoric and even a few non-fascist GOP voices. There are my own attempts at inspirational call-to-arms, and of course our President is always good for at least one stunningly hypocritical tweet. Oh, and he said “a bad high school student would understand” his Muslim ban was right. That I thought everyone on Facebook would instantly recognize the references suggests maybe I’m spending a little too much time in the deep end? 06/02/17 How Many Plagiarists Does It Take to Screw Up the Trump Senate Confirmations? That’s what Betsy DeVos, President Trump’s nominee for Secretary of Education, wrote on her Senate confirmation questionnaire. According to the Washington Post, it is. The newspaper first reported the story and made the allegation. Sticking to plagiarism though, Russell gives two examples from education websites to support his claim that DeVos did not commit any infraction. Do his examples support his claim? The website statements share two consecutive words: “and thrive.” He’s right. That’s not plagiarism. DeVos’ statement shares five non-consecutive words with CAPP: “every child … learn … and grow.” That’s also not plagiarism. But her statement shares eight non-consecutive words with LGK: “child … safe … environment where .. can learn … and grow.” Is that plagiarism? In my college, a student who submitted a paper that contained the uncited and verbatim passages that DeVos used would be brought before our Honor Council and likely expelled. Whether it’s “really so bad” for the U.S. Secretary of Education to be held to a lower standard than the students is in my first-year writing seminar is a matter of opinion. Whether she plagiarized is not. She did. I’m sure the student who plagiarized in one of my classes last year felt his violation of the Honor Code wasn’t “worth making a fuss over” either. That’s why I begin every semester of WRIT 100 with a Plagiarism Test Certificate. Perhaps the Senate should use it for their confirmation hearings too. This semester I also included the admonitory example of another Trump appointee, Monica Crowley. The Fox News contributor was in line for a senior communications position in the National Security Council but stepped down after multiple examples of plagiarism were identified in her 2012 book, her Washington Times column, and her Columbia University Ph.D. dissertation. CNN provides a passage-to-passage comparison of dozens of examples. I recommend it as essential reading for anyone applying to Washington and Lee University. Prospective Trump nominees might take a look too.